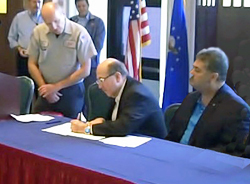 Local 898 President Rick Boardman (left) and Southern Territory GVP Bob Martinez (right) look on as IAM President Tom Buffenbarger signs documents that pledge full support for the HPWO partnership at Vance AFB in Enid, OK.
Less than 12 months after resolving a strike by nearly 900 members of Local 898 at Vance Air Force Base in Enid, OK, both sides were back at the table recently to reaffirm their commitment to a different kind of agreement. Contractors, union representatives and Air Force officials at the base all agreed to recommit to the goals of a High Performance Work Organization (HPWO) partnership that was first signed in 2004. The partnership calls for management and union members to work together at every level of the operation, from staffing and scheduling decisions to collaboration over changes with the potential to lower costs, enhance job security and improve productivity. Taking part in the recommitment ceremony was IAM President Tom Buffenbarger, who called the HPWO partnership an opportunity to move beyond the strike and focus on building an environment that works for employees, contractors and the Air Force. IAM members at the base include landscapers, instructors, firefighters and aircraft maintenance personnel.